Beautifully appointed villa. All appliances and equipment are state of the art. Air conditioning and ceiling fans in all rooms. All linens, including beach towels are included. Kitchen is fully equipped with full size refrigerator/freezer with ice maker, gas stove and oven, dishwasher, coffee machine, microwave, wine cellar, all pans and pots, kitchen utensils, dishes and glasses galore. Special attention was paid to comfortable bedding and linens. Bedrooms: 1 king bedroom, 1 king and small sleeper sofa, 1 bedroom with 2 double beds. Each bedroom has its own bathroom and small patio; Queen Sleeper Sofa in living room, 4th full bathroom adjacent to living room. The large, landscaped garden patio features a cozy out door dining area, Webber gas grill and comfortable lounge chairs. Large awnings provide cool shade in all patios. We are just foot steps from our beach with wonderful views to St. John and the British Virgin Islands. Enjoy the view and beach while eating at the Margarita Ville Restaurant. Walk through the tropical gardens of our small community to our pool, which provides lounge chairs, tables and chairs in shaded areas and a kiddy pool. Many of our guests return because they enjoy the quiet and privacy of Pineapple Village - and the value is great for a property so close to the beach. Red Hook, home of many fishing boats, and the ferry port for trips to St. John and the British Virgin Islands, is home to many Restaurants and bars, and is only a 7 minute car drive away. Convenient shopping - super market and take outs - are also located in Red Hook. We lived in St. Thomas for 20+ years, part of it on sail boats as charter captains. Marc sailed to St.Thomas from his native Rhode Island, while Marianne, coming from Austria found the islands looking for sailing paradise. Marc founded Blazing Photos, and at one point had 4 One Hour Photo Labs on St. Thomas while also being an active photographer. After moving to Florida we concentrated on our corporate clients and have traveled the world doing photography. We first bought in Pineapple Village in 1989. Our children grew up here and enjoyed life in one of the only properties on St. Thomas that is flat, by the ocean, gated, and a community where we actually could walk trick or treating.... After we moved to Florida we kept the property to enjoy the tranquility and laid back atmosphere of Pineapple Village. We travel the world with our clients doing photography and whenever we need rest, serenity, a nice breeze and Caribbean way of life we enjoy our vacation home. We renovated our villa to make it a wonderful, cozy experience, while we also equipped it with everything our modern life requires. Automatic Switch Generator, great furnishings, cable TV in all rooms, friendly and meticulous housekeeping services. Just a few footsteps from Pineapple/Margarita Ville Beach, a maintained beach for residents of Margarita Ville and Pineapple Village. We provide Beach Towels. Just a few steps through our property to the beach that we share with Jimmy Buffet's Margarita Ville Resort. new LG front loader washer, will not be offered to guests directly but can ask housekeeper for help. Small charge applies. We provide all towels in bathrooms as well as beach towels. GE Freezer/fridge with ice and water dispenser, dishwasher, coffee machine, GE gas stove and oven with griddle, wine cellar, exhaust, microwave, hand mixer, all dishes, pots and pans and table ware. Outside dining area in private patio. Awnings provide shade. Newly renovated pool in the center of Pineapple Villas. Lounge chairs, tables and chairs and shaded areas provided. Just Foot Steps from Pineapple/Margarita Ville Beach, and Just a 5-6 Minute Walk to Coki Beach, Best Snorkeling Beach on the Island. 2 minute drive to beautiful Lindquist Beach at Smith Bay Park. Our family of four recently had the pleasure of enjoying the villa from March 31st through April 7th. 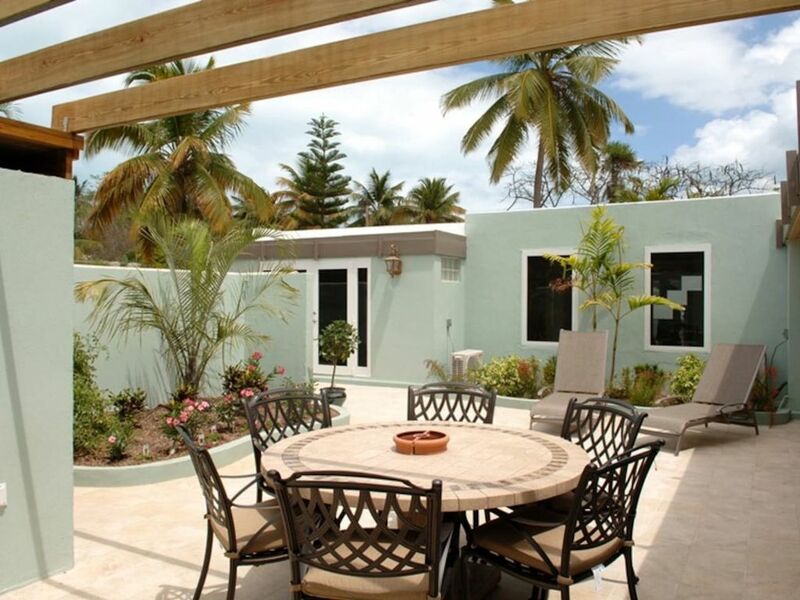 The property is beautiful, accomodating and offers some privacy as well. I recommend renting a jeep for the week to explore both St. Thomas and St. John at your leisure. The villa has great access to Coki beach, Smith Bay and the Red Hook area where you can catch the barge or ferry to St John. We highly recommend Trunk Bay and Cinnamon Bay in St. John especially if you enjoy snorkeling. The villa is essentially an extension of Margaritaville where you will find good drinks, good food and lively pool access. If you prefer a more laid back atmosphere, there is also a pool at the back of Blazing Villas which was virtually our own private pool due to the limited activity. Tamika ensures your stay is stress free by providing turn down service and tidying up behind you. We really enjoyed our week and look forward to another visit. The villa was great. Very spacious and clean and Veronica, the housekeeper, was great. OTOH, my 3-yr-old granddaughter, who discovered that she is not a Jimmy Buffett fan, could not sleep due to the blaring music from the neighboring Margaritaville Resort at all hours, including until 3AM one weekday night. Also, due to fresh water constraints, guests are not allowed to use the washer & dryer (which was a problem late one evening when my granddaugher got sick (probably from the Margaretaville Resort restaurant's dreadful food); instead, Veronica has to do it for you. A minor complaint: very stingy with consumables--there was an empty soap dispenser in one bathroom and no soap at all in the other bathrooms; there was a salt shaker in the kitchen but it, too, was empty, etc. My apologies for not having had the soaps in the bathrooms, that was an oversight by Veronica because there is plenty on hand. We strive to provide as much as possible, and I will tell our new housekeeper to make sure to replenish these amenities. I hope you all in all enjoyed your stay and we want to thank you for choosing our villa! Trying to find suitable lodging for 4 couples on St Thomas was a challenge. We lucked out with this space. The 3 bedroom villa was roomy inside and out. The large bedrooms and baths were very nicely done. Our favorite had to be the fantastic private courtyard which was perfect for 8 of us hanging out, dining, enjoying the sun or reading a book. The inside living area was also perfect in case it rained but we never had to move inside. We also enjoyed the location. You can walk to a beautiful local beach and there is also a fun restaurant very close. Our friends want to meet up here again some day. Thanks for the great stay. We are very happy that you enjoyed our villa. The location of Pineapple Villa on St. Thomas really lends itself to a wonderful stay - we are one of the very few communities on totally flat grounds with easy access to beaches. Perfect for all ages. Thank you for taking such good care of our villa. We hope to welcome you again! We enjoyed our stay at Blazing Villas, for the most part. It was clean and very roomy. Everyone got their own bedroom and bathroom, which is a huge plus. It was convenient to great beaches and restaurants. The one issue I have is that in the listing, they list washer and dryer as amenities for the villa. This is a major reason why we chose this property. We like to pack light and have access to washing facilities when we travel. Especially with a family. It makes it so much easier. However, when I went to look for the washer and dryer, I could not find it. I asked the housekeeper, Veronica and she said it was not for guest use and it is locked in a utility closet outside of the villa. This made no sense as they advertise washer and dryer. I do not feel this is right and it is misrepresenting. Only after finding the villa manual, did we find out that the washer and dryer is only available for longer stays. This should be spelled out in their listing. Not very helpful after you've already arrived there. I would have picked a different property if I had known this. Other than that, not too much to add. We did have a pretty major water issue the 2nd day of our stay. The water stopped working in our bedroom and in all of the other bedrooms. There was no hot water at all. There was cold water in the sinks but no hot and no water at all in the showers. Fortunately, Veronica was available to coordinate maintenance. However, it did not get fixed after the first plumber had been there. He left without fixing it. She was able to get someone out there the following day - but at this point we were already on day 4 of the visit, and day three with minimal water. It did finally get repaired and we were happy to have hot showers again. I understand things like this happen. There was also a lot of water leaking in the master bedroom closet during a rain storm and the floor was covered in water. Five stars to Veronica, the housekeeper. She was wonderful. Thank you for your thoughtful review. Very sorry about the trouble with the water. This was a very unfortunate chain of events caused by someone before your check in using the water during a power outage - which caused the waterpump to be air locked. A very easy fix, which our handyman fixed, except he forgot to switch the valve back to "open" and then left the island. The next plumber came, switched the valve and voila - hot water again. It would be funny if it wasn't while you stayed there..... So so sorry. We do have a policy about the washer and dryer, and that is that only Veronica can use it, but that also includes doing laundry for the guests. I am surprised she did not offer that to you and will have another conversation with her about that. I will make sure that this policy will be explained better in the future and thank you for pointing this out. The property was fine but the smell of dead fish/alga was horrendous. Everything at Blazing Villas was as advertized. Three huge bedrooms with beautiful ensuite baths and very comfortable bedding. Much larger than I would have expected. Plenty of room for 3 couples. Looked as though the entire unit had been recently remodeled. We especially enjoyed the private courtyard and the well equipped kitchen. Although our group only rented for three nights we wish we could have stayed longer. Marrianne the owner was very helpful and Veronica the housekeeper assisted arranging for taxis, an island tour and answering questions about the unit. You just can’t go wrong staying at Blazing Villas. St. Thomas is a beautiful island and we are very happy that you enjoyed our villa. Thank you for being so respectful and great renters! We hope you will come back and enjoy the island and our villa again! We are within walking distance to Coral World, a fabulous Marine Park. Watch the live reef in the underwater tower or swim with Sea Lions.